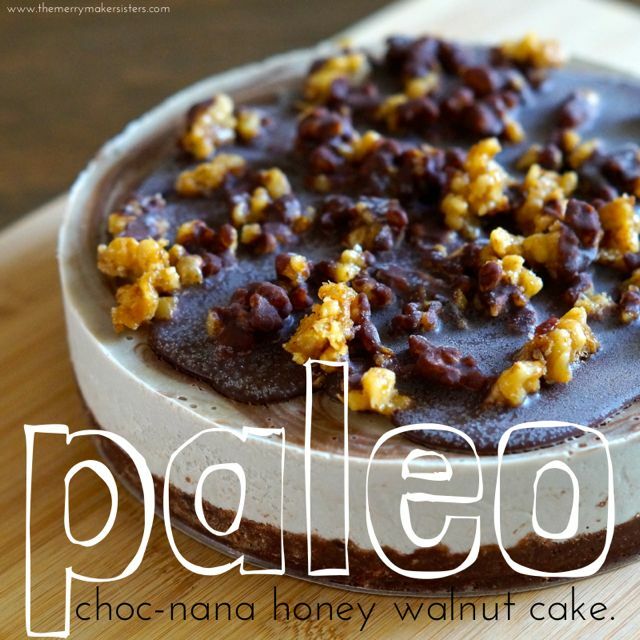 Raw Paleo Choc-nana Honey Walnut Cake. 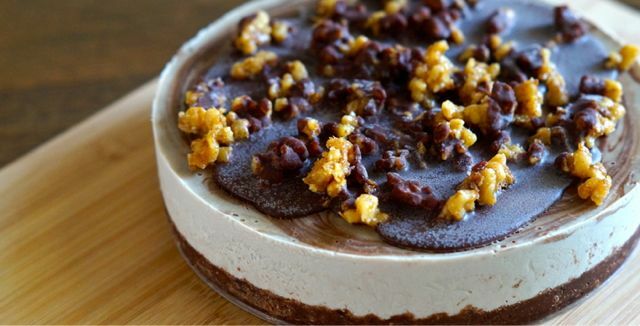 We posted pictures of this wonderful raw paleo choc-nana honey walnut cake (it’s a mouth full!) to Facebook asking if you guys would like the recipe… turns out you guys would LOVE the recipe! Who wouldn’t really? We’ve combined some of the best flavours in the whole wide world and come up with this delightlfully over the top cake that suits any occasion! 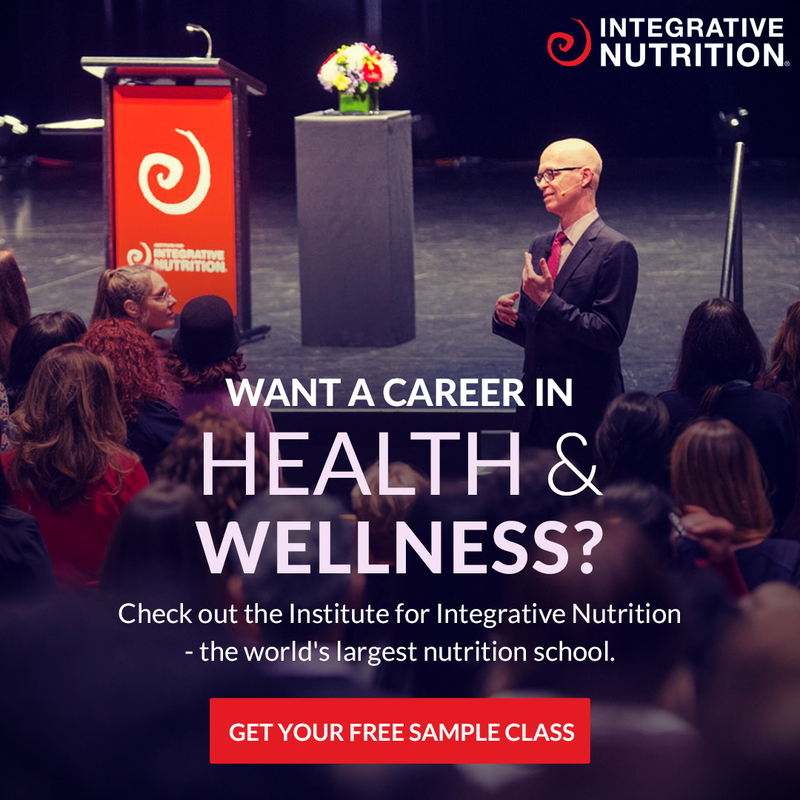 Chocolate: tick, Honey: tick, Banana: tick, Walnuts: tick! We made this for a friend’s birthday and the feedback went something like “where’s the rest? !” and “shotgun seconds!” You won’t regret whipping up this treat! There’s a few extra steps to make it look super amazing but it’s seriously worth it! ps. 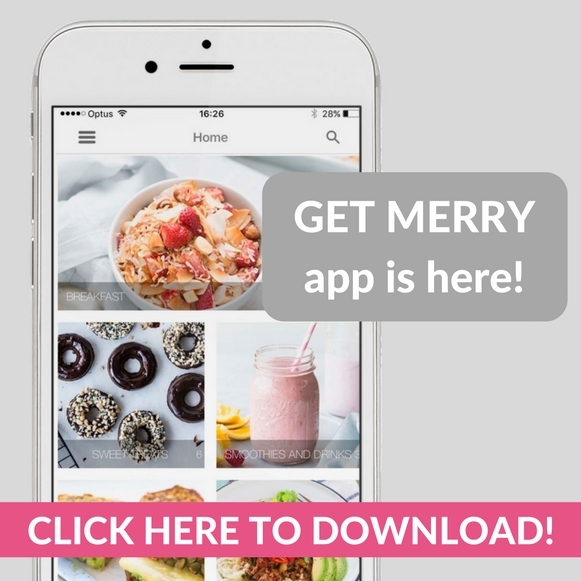 spread the merrymaker love by sharing pictures of your drool-worthy creations on social media! Use #themerrymakersisters so we don’t miss it! Now add the coconut milk, coconut oil, raw honey and banana. Take out the base from the freezer and pour half of the filling on top of the base. Add the raw cacao powder to the remaining filling in the food processor and whiz until smooth. Pour this on top of the banana filling, then, using a chop stick (or something similar) swirl the two flavours together to make a pretty pattern. Place the cake into the freezer (you could leave the cake as is or make it super special with our topping below!). Heat the honey a little (we like to run the jar under hot water), then mix the crumbled walnuts and honey together. Spread these onto the lined baking tray and place in to the oven for 10 minutes, allow to cool, then break apart (it should be toffee like and crumbly). Whip up half a batch of our paleo chocolate (recipe at below link), then take the cake out of the freezer, sprinkle the honey walnut toffee on top and drizzle the chocolate over the cake. When ready to serve, let sit for 10 minutes, then rub the outside of the cake tin with a hot cloth and release the spring form slowly (you may need to run a knife around the edge). Store the remainder of your delish cake covered in the fridge for a week. It can also be stored in the freezer and thawed out when it's cake time! Get our paleo chocolate recipe right here!